Let’s start over with this 730 movies in one year. Cast: David Denman, Gillian Jacobs, Kevin Hart…. 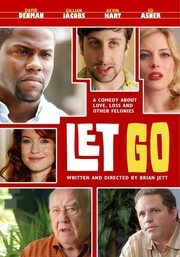 Let Go follows the story of parole officer Walter Dishman and 3 ex- convicts under his supervision. The story is slow, there was moments where it dragged. Overall the movie was ok. This movie is under comedy, but to me it wasn’t a comedy. It might have some parts that can be considered comedy but to me it wasn’t. I don’t know what to say more about it. I give it a 2 out of 5.